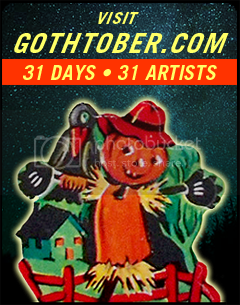 There are passionate feelings about traditional candy corn. 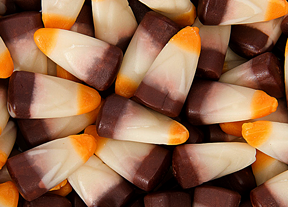 People either like candy corn, or they vehemently despise it, and getting them to try even weird hybrid candy corn flavors is a bit of a chore. I’m a candy corn purist, can’t deal with super strange “Easter Corn” or “Valentine’s Corn” I don’t even know what those flavors are, freaks me right out. S’mores are generally associated with summer and camping, but because of the chocolate and burnt marshmallow factor, they can overlap into Autumn as an acceptable Halloween candy concept. This means that candy corn offering the facsimile of s’mores is much more decent than, say, Christmas candy corn, which probably tastes like pine needles or gingerbread and… just… no. The picture of the bag here looks much brighter and delicious than the actual bag I bought at Target, the real bag looks dull and decidedly inedible. The little triangles of brown, cream and orange could almost be rootbeer flavored, and they all look about 2 years old. But I’m all into the hype, so I got ’em, dumped in a bowl at CraftNight and recorded my observations. Overall, the reaction was one of positivity, with a couple of “so-so” and one or two absolute disapproval ratings from people who don’t like candy corn in ANY flavor, or just couldn’t handle the taste. These grow on you, they look rather unremarkable, but then, over time, you just keep going back to investigate the character of this candy again and again. Perhaps this is the mark of a good candy? It’s complex in that it really does have three distinct differently-flavored segments, all artificial, all vying for your attention. 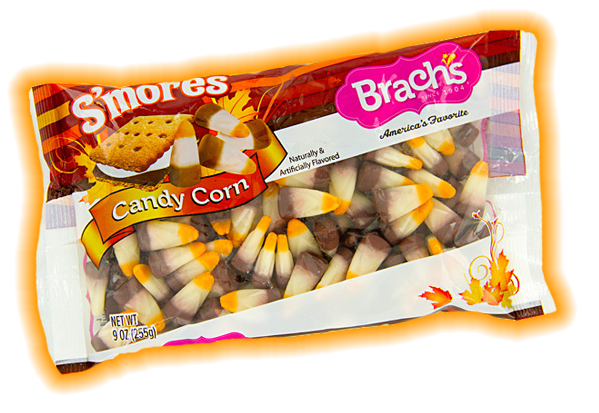 The taste is about 1,000 miles away from the combination of actual graham cracker, chocolate and marshmallow, but just the fact that a candy corn would have the audacity to believe in itself enough to inform you that it is evocative of s’mores makes you want to eat it. Some people are going to get religious about these and seek them out and buy all of them, and some people will just eat them because they are there. The most dangerous aspect about them seems to be that even though many of us felt “so-so” about s’more flavored candy corns … we couldn’t stop eating them. Thumbs up, get a bag for the party!